While others need a coffee fix a day, mine is a milk fix. I always start my day with a glass of milk and on nights when I can't sleep, a nice warm glass of milk helps too! Yup I love my dairy products and not just coz it taste good, there's tons of benefits too! 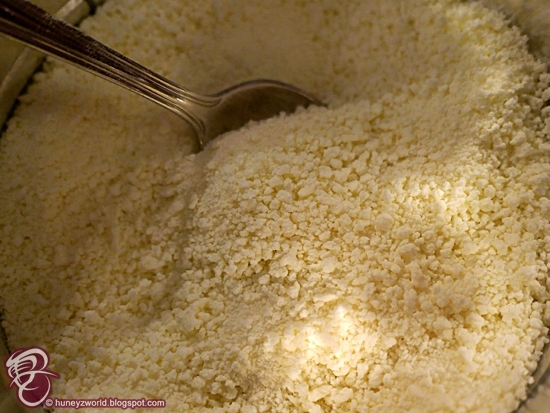 Brimming with vitamins and minerals such as calcium, milk is regarded as one of the most nutrient-dense foods. It is known to strengthen bones and prevents osteoporosis. Teenagers and elderly folks have the highest calcium requirements so they need to drink about 3 cups of milk daily. Milk can help maintain healthy teeth, reduce high blood pressure, lower risk of diabetes and improve skin’s health. It also lowers the risk of both colon and breast cancer. 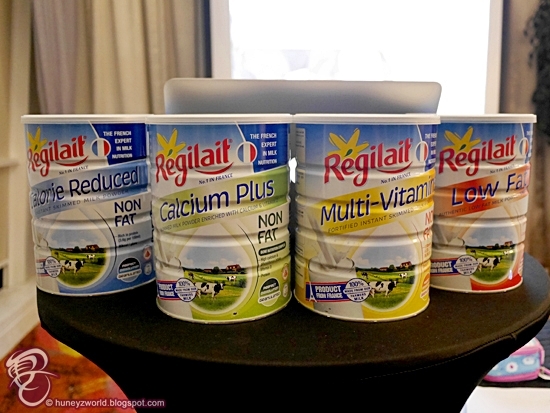 If you are fan of milk, let me introduce you to Régilait, a lauded and beloved purveyor of high-quality instant granulated milk powder. 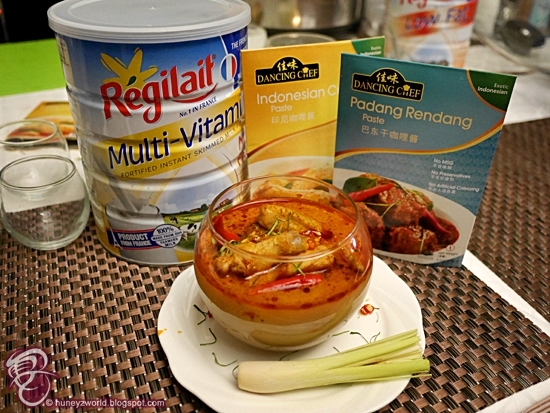 It has been around since 1947 and they have now makde their way into Singapore market and already awarded the Healthier Choice and Halal certifications! As Régilait is a French dairy cooperative, it controls the entire chain of milk production - from procurement at farms to manufacturing of the final products, offering full traceability. Their milk are 100% real pure cow’s milk, with no fillers added, no maltodextrins and really rich in proteins and all of the nutritional qualities are preserved via their gentle manufacturing process. Their milk is suitable for consumption by everyone from ages 3 and up. This milk is fat-free and allows controlled calorie intake to help you maintain your weight. For diabetics or consumers with high cholesterol, the Régilait CALORIE REDUCED helps to restore a balanced diet. 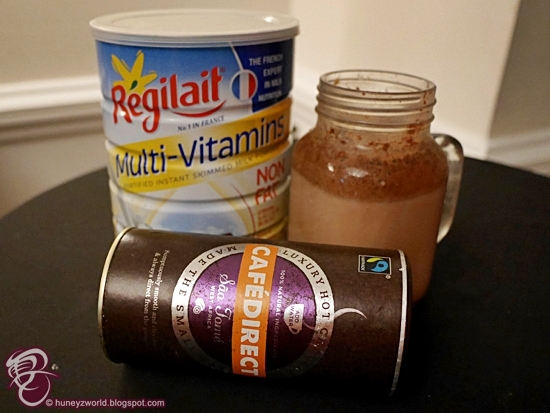 One glass of Régilait Calorie Reduced contains only 89 kcal! Régilait CALCIUM PLUS imbues drinkers with the benefits of calcium and vitamin D. Containing an optimal composition of calcium, proteins, vitamin D and phosphorus, calcium is easily absorbed and becomes well fixed in the bone when consumed. Drink two glasses of the fat-free Régilait CALCIUM PLUS to meet your daily calcium needs. Get the boost you need with the fat-free Régilait MULTI-VITAMINS. It contains eight vitamins: A, D3, C, B1, B2, B6, B9, B12. Vitamin A can help you achieve good vision, a healthy immune system and spur cell growth. The B vitamins can help to keep your body up and running —just what every working adult, student and sport enthusiast needs. Vitamin C helps to grow and repair tissues in all parts of your body while vitamin D3 improves overall bone health. 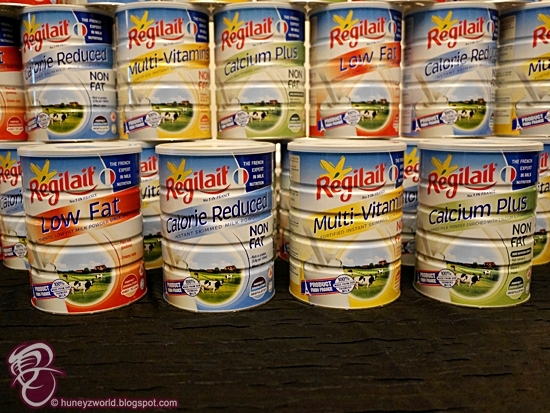 Régilait LOW FAT, a tasty semi-skimmed cows’ milk produced on the best French pastureland. It contains 14% more calcium and 25% less saturated fat than a regular dried milk. Our gentle manufacturing process preserves all of the nutritional qualities of the milk (calcium, phosphorus, magnesium, protein, vitamins B1, B2, B9 and B12). Vitamin B1 and B2 enable the body to use nutrients, vitamin B9 is necessary for normal cell division and replication, vitamin B12 is involved in the formation of red blood cells. What I love about their milk is that it comes in granulated form instead of the usual powder version, which means you can enjoy the milk with warm or even cold water! The milk is instantly dissolved in the water, without any hassle of having to keep blending the powder till your arms go weak. Of course, the consumption don't just stop at purely drinking it. 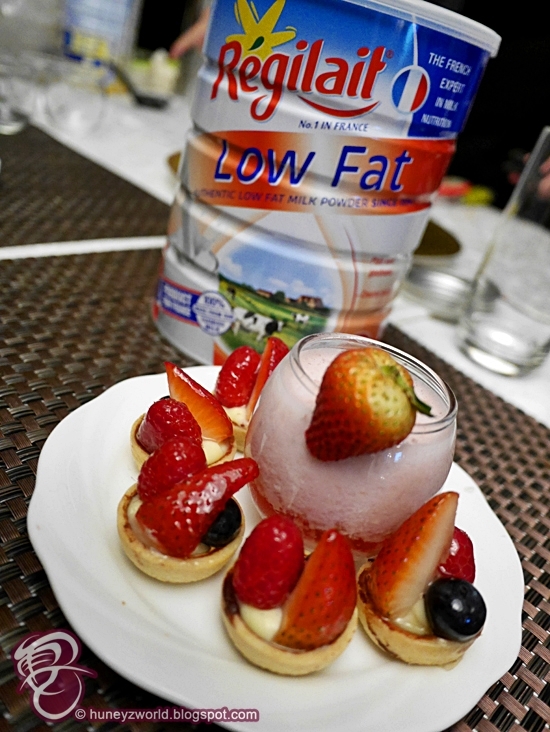 At the launch, Chef Lisa Leong showed us how to include milk into our daily dishes or desserts! First dish she showed us, was Curry Ayam Indo. Using milk in replacement of coconut milk, makes it a healthier dish, diminishing the cholesterol risk, whilst bumping up the multi vitamins - A, D3, C, B1, B2, B6, B9, B12! Next, there was crispy delicious sconces to dip into the curry and some sweet treats - Strawberry Tartlets, Strawberry Milkshake and Chocolate Milkshake, totally made together with the Régilait milk powder range. 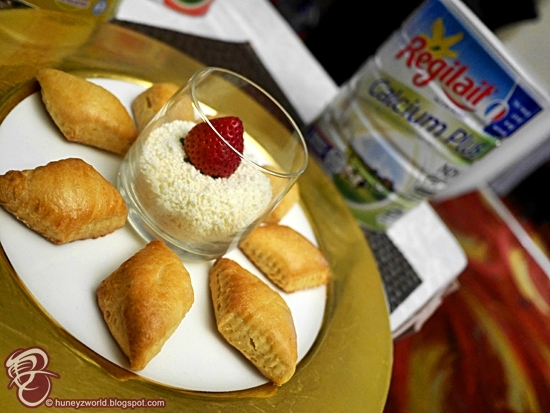 I've been having the Régilait CALCIUM PLUS ever since I was introduced to it, I love how creamy it taste, nothing short of those fresh milk, I'm gona try cooking it with other dishes next. If you want the recipes, scroll to the bottom of the post. Stay creamy my Huneybees!